The ultimate everyday cookbook you'll turn to again and again. Like her mentor Julia Child, Sara Moulton believes that with the right guidance anyone can become a good cook. After all, great home cooking is in the details. Having the proper tools, understanding temperature and cooking time, and knowing how to balance flavors are simple skills that elevate everyday meals. 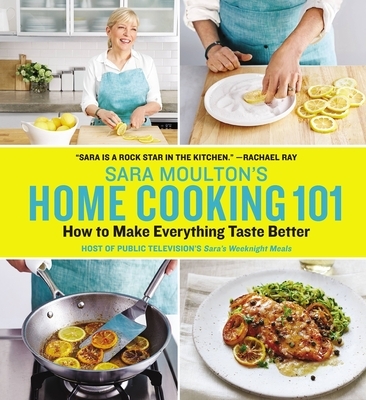 In Sara Moulton's Home Cooking 101, Sara teaches readers how to a make good dish taste even better. This invaluable guide is packed with essential techniques, expert tips, and practical advice to sharpen your sense of taste and cultivate confidence in the kitchen. With wit and wisdom, Sara guide readers through the fundamentals, then offers 150 hit recipes to illustrate, step-by-step, the time-tested methods that make each so delicious. You'll learn to navigate your stove, season like a pro, and add umami to a dish while discovering new ideas for weeknight dinners. A stellar cast of guest chefs -- including Rick Bayless, Amanda Cohen, Hiroko Shimbo, Jacques Torres, Joanne Chang, and Marc Vetri -- also contribute favorite recipes and in-depth lessons on everything from successful stir-frying to choosing the right steaks. Approachable for beginners and inspiring for home cooks of all levels, this is a cookbook you'll want to keep handy on your kitchen shelf.